Trying to eat healthy during a busy week can be really hard. Not having enough time to prepare a meal at home can result in you just picking something up for dinner that probably isn’t the healthiest choice but is quick and easy. I have found that planning ahead of time is really the most important way you can stay on track during the week but I do have some other helpful tips I would like to share. 1. If you don’t plan your meals at all, trying to change your habits and plan all of them may be very difficult and ultimately lead to you not being successful. So start slowly, if you never plan what you are going to make for dinner ahead of time, or eat out most of the time, pick out two meals you would like to make during the week prior to going to the grocery store, so you can buy all the appropriate ingredients and won’t be running around last minute realizing you need something. 2. Use your freezer! If you are making quiche for example, and only need one, make two and freeze the extra. That way on nights you are very busy, you can just pop a pre-made homemade quiche in the oven. If you don’t know how to make a healthy quiche I do have a recipe here. 3. Have a quick and easy go to meal that you know you can prepare in a flash. If I know there is a night coming up where I probably will only have a few minutes to prepare a meal I make sure I pick up some portobello mushrooms and reduced fat feta cheese so I can make stuffed mushrooms… you can find my stuffed mushroom recipe here. 4. Make sure you stock your fridge and pantry with healthy ingredients. You can’t make something healthy out of nothing, and may end up ordering pizza if you have nothing to work with. I always have brown rice, quinoa, whole grain pasta and black beans in my pantry. I also usually have an emergency can of tomato sauce too. In my refrigerator I always have fresh veggies and fruit, milk and reduced fat cheese. And in the freezer I like to have some proteins such as chicken or fish and some frozen veggies in case I run out of fresh ones. 5. In addition to buying fresh fruits and vegetables that I keep in the fridge, I also purchase a couple that I know will last longer, so if I don’t end up using them this week, I can use them next week. I hate when foods go bad…so wasteful! Sweet potatoes, butternut or acorn squash, and red potatoes tend to last a lot longer so I like to keep 1 or 2 of those on hand. 6. Make something new out of your leftovers. For example, last week my husband made fish with brown rice and black beans and plantains. He accidentally made too much rice and beans so the next day I added some spinach and mozzarella to the rice and beans and used it to stuff a baked sweet potato I happened to have on hand… and it became a brand new meal! 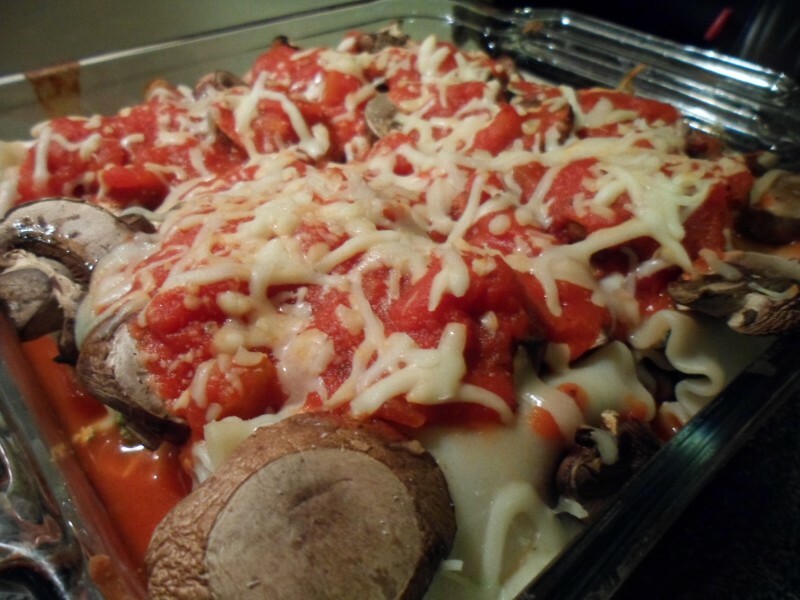 I love pasta, vegetables and cheese so I am sure to enjoy any recipe I can make that includes all three of them, so a vegetarian lasagna really gets me salivating. Unfortunately, because I am gluten free, I often cannot order pasta dishes at restaurants, but at least there are a lot of gluten free pasta brands available at the grocery store. I usually stick to whole grain brown rice pasta (whole grains provide fiber and other essential vitamins and minerals and are important for heart health) and my favorite brand is Jovial. It doesn’t get mushy or anything like some of the other rice pastas, and I even make a special trip to a Publix that is farther from my house every once in awhile so I can stock up on it (it is that good). If you are gluten free just make sure you use a gluten free (and whole grain) lasagna noodle and gluten free tomato sauce. Vegetables, eggs and cheese are naturally gluten free, but always check your labels just in case! 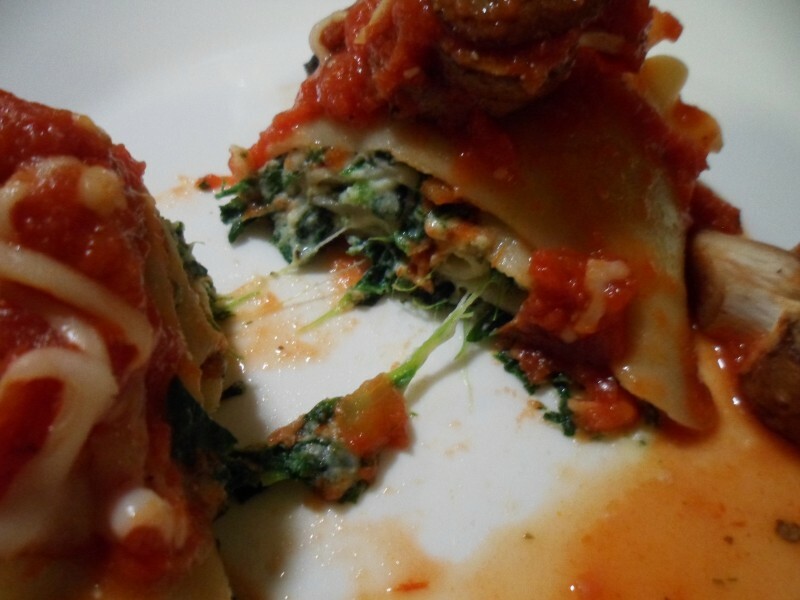 If you are not gluten free, I would recommend choosing any whole grain lasagna noodle. Preheat oven to 350 degrees. Cook lasagna noodles according to package directions. In an 8×8″ glass pan add 2/3 cup of tomato sauce and spread to cover bottom. Add ricotta, egg, spinach and 1/4 cup shredded cheese in a medium mixing bowl. Add garlic, basil and oregano. Mix well. Allow cooked noodles to cool slightly and lay out on a cutting board or baking sheet. Spoon 3 tablespoons of cheese/spinach mix on each noodle, spreading down the length of the noodle. Roll each noodle up and place seam side down in pan with tomato sauce. Sprinkle mushrooms over top after all 8 noodles are rolled up in the pan. Pour a cup of tomato sauce and a quarter cup shredded cheese evenly over the roll ups. Bake at 350 degrees for 25-30 min or until it is piping hot inside and mushrooms on top are soft. I know I just posted a plantain recipe a few weeks ago, but I used the unripe green kind for that recipe. Today, my recipe is all about cooking the very ripe black plantains. Even though in both recipes I basically just add oil and bake them, they taste very different. This is because during the ripening process, starch is converted to sugar, so the riper they become, the more sweet they will taste. When they are green, they are more like a potato, and when they are mostly black they taste more like a banana. 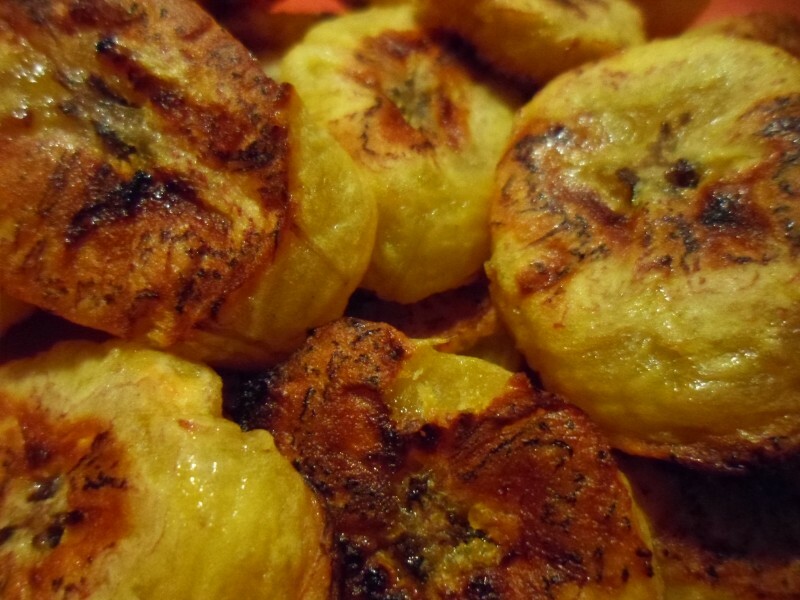 If you want to know how I like to cook the green plantains click here, otherwise keep reading if you want to make sweet ones. Plantains are full of potassium, vitamins a and c, magnesium and fiber. The United States Department of Agriculture does consider plantains to be a “starchy vegetable” and recommends approximately 2 1/2 – 3 Cups of vegetables a day for most adults, so adding a side of plantains does contribute to meeting your vegetable intake for the day. However, plantains are traditionally fried, so if you order them at a restaurant, they may not be the healthiest choice. I like to coat them with a small amount of oil and bake them (very simple) and serve them as a side or you could even add a little cinnamon and frozen yogurt to make a satisfying dessert. Preheat oven to 400 degrees. 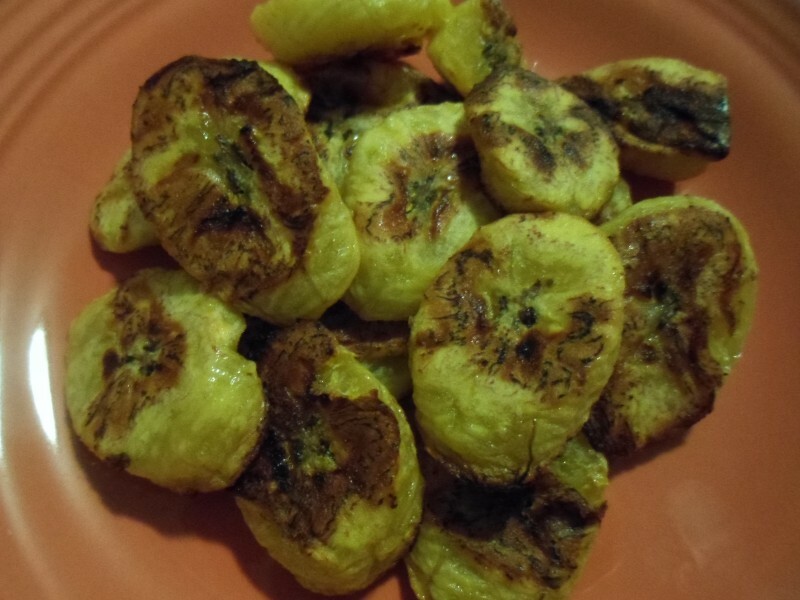 Remove peel from plantain and cut into 1/2 inch slices at an angle to make oblong slices. Put slices into a small bowl and add oil. Toss to coat. Lay slices out on a baking sheet. Place in preheated oven and bake for 15 minutes or until the tops of the plantains start to brown/caramelize. Remove from oven, flip slices over and bake for another 5 minutes. Remove from oven, allow to cool slightly, and enjoy. Serves 2.